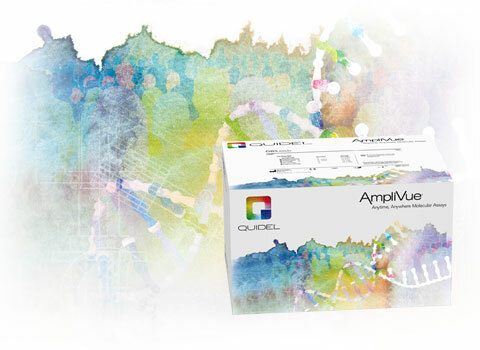 The AmpliVue GBS Assay is an in vitro diagnostic test for the direct, qualitative detection of Group B Streptococcus from vaginal/rectal swabs following 18 to 24 hours incubation in Lim broth. The assay utilizes helicase-dependent amplification (HDA) for the amplification of a highly conserved fragment of the Thiolase (atoB) gene sequence and a self-contained disposable amplification detection device that allows for visual evaluation of assay results. An overnight Lim Broth culture enriched from a swab is lysed by simple heat treatment, aliquoted and added to a Reaction Tube containing lyophilized mix of HDA reagents including primers specific for the amplification of a fragment from the conserved region of the Thiolase (atoB) DNA. Competitive amplification of the process control DNA takes place unless amplification inhibitory substances are present or the sample processing fails. Easy-to-use format, just rehydrate and add sample.